This 6.75" Quad Rail replaces the A2-type handguard for M4 and AR-15 / M16 rifles, offering 4-rail Picatinny performance. It's an easy upgrade that increases the versatility of your rifle by allowing you to easily add a foregrip, tactical lights, laser, whatever you need. Please Note: This item is coming with round holes, NOT slotted holes as pictured. Sorry, no choice. 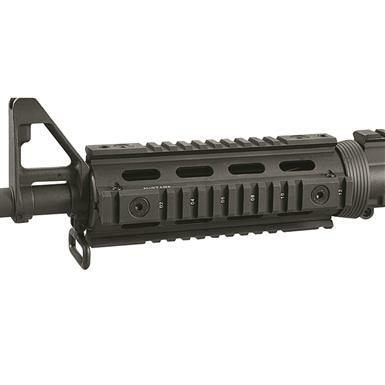 NcSTAR AR-15 Quad Rail, 6.75 is rated 4.6 out of 5 by 204. Rated 5 out of 5 by Trump2020 from Perfect fit Put on Wyndham carbon AR and was perfect fit. Rated 1 out of 5 by Mikeb from Expensive paper weight Did not work on my Anderson Arms carbine. Rated 5 out of 5 by Fish6982 from Perfect fit Fits perfectly on dpms 5.56/223. Quick shipment, and came with a goodie bag. Rated 2 out of 5 by Ajnew60 from Good price, wrong part Great looking product at a very reasonable price, but wrong size. I just got this rail in the mail today and am already returning it. I have a DPMS Oracle and I’m not sure how others say this fits easily. No way it would fit. Rated 5 out of 5 by Sarge from After market - perfect fit!!! I've had the stock plastic handguards on my DPMS Panther since I bought it in 2002. They had become beat up, the internal heat shields were bent up to the point they rattled around loose. I decided on these kinda blindly. I got them in an expeditious manner. Tried to install them, but they seemed not to fit, due to a different mounting method. I found the video on how these were to be installed. OMG, they've made my baby like new again!!! Rated 5 out of 5 by Richard from Very nice, one problem, it wasn’t a nc-star that was sent it was a firefield.